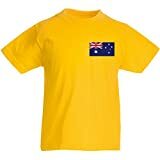 Great customisable kids retro football T-shirt, Unofficial Aussie style. This entry was posted in Soccer and tagged Australia, customisable, Custommade, Football, Kids, TShirt by FPSports. Bookmark the permalink.